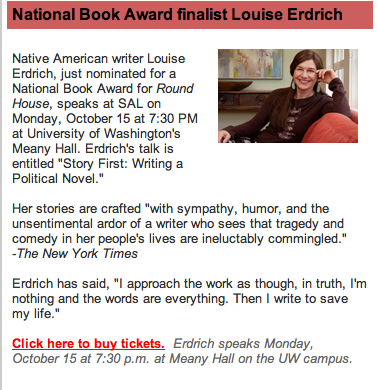 Seattle Arts & Lectures (SAL) presents Native writer Louise Erdrich tonight at UW’s Meany Hall at 7:30 PM. She’s a strong vivid writer approaching issues of local culture and national politics and everything in between. Erdrich has published three critically acclaimed poetry collections; one short story collection,The Red Convertible (2009); six books for children, including The Leap (1990) and The Porcupine Year (2008); and 13 novels, including Love Medicine (1984), winner of the National Book Critics Circle Award; The Beet Queen (1986); The Plague of Doves (2010), a finalist for the Pulitzer Prize; and Shadow Tag (2011). Erdrich is an enrolled member of the Turtle Mountain Chippewa, Pembina Band and the owner of Birchbark Books, a small independent bookstore in Minneapolis.” Buy tickets here or at the door.